All events are finals now - Cameroon has just beaten Spain in a playoff after extra time in Football(Soccer) - can't wait to witness the 9 athletics finals I'll see tonight from Row 61! The last big track and field session - was very exciting - nine athletics finals punctuated by medal presentations with new and old anthems. We were seated in the northern stand about ten rows below the Olympic cauldron. Whenever the crowd went quiet (not very often) the phoosh of the cauldron reminded us where we were. The sight of the Olympic flame helped warm us as the evening was cold and blustery. Anyone with a personal story to tell about the humanitarian work of Red Cross is being asked to contribute to a new book to coincide with the forthcoming centenary of Red Cross in Australia. What's fresh in my mind is this morning's expedition to the Sydney Regatta Centre at Penrith. As this is on the western edge of Sydney (we live on the northern edge) we chose to drive and use the park and ride facility - in just over an hour we were in our seats ready for action but the Gods were not ready. The area was enveloped in a heavy fog and we couldn't see over to the other side of the water. When the first kayaking semi-final started half an hour late the fog had morphed into a light mist, by the time we left Penrith the sun was shining. We got away just in time as a temp. of 34 C. was forecast. We saw a range of 1 and 2 person kayak and canoe semi-finals. As one who can't maintain her balance on anything I was so impressed by the canoeists who rowed on bended knee - a sight we don't see in Australia. I'm fascinated by how the single canoeists stay straight when they're only paddling on one side - I guess they set their rudder to counter this. I was not looking forward to this session at all - there was an article in the newspaper yesterday which nominated it as the most boring set of events. It didn't have the excitement of a close basketball match or the grace of rhythmic gymnastics but the combination of a beautiful venue, shimmering water, shining sun, a backdrop of our unique Blue Mountains (they look blue from a distance due to foliage of gum trees) together with brunch lovingly prepared by my son and a series of short but close races gave us a morning to remember. The night belonged to nations who don't figure highly in the medal count. The long, lithe Kenyans with their beaming smiles won two golds (and 1 silver and 1 bronze)- in the 3000m steeplechase and the 1500m race. Morococan - Hicham El Guerrouj, favourite in the 1500m, was sandwiched between 2 Kenyans at the finish. Someone near me commented that he'd better wait a while before returning to Morocco. A 17 year old Polish hammer thrower won the women's event whilst Polish Robert Korzen........ won gold in the 50km walk (a week after winning gold in the 20km) so we stood twice for the Polish anthem. I was annoyed and embarrassed for Australia when the young woman did not stand for the national anthems. My son pointed out that she had been knocking back beers all night and was probably incapable of standing. Warm nights and warm beers do not promote sobriety. When GenealogyWise a social networking site for genealogists, appeared on the scene I had high hopes for its usefulness to genealogists. I was similarly excited when Google announced their Wave product and set up an Australian Genealogists Wave. This product was even les popular with Australian Genealogists than GenealogyWise. In my first post about this product in July 2009 I said "I, too, jumped on the Genealogy Wise bandwagon very early and have watched its amazing growth over the past couple of days." I took the initiative and set up a group for Australian Genealogists as I found the site very UScentric. 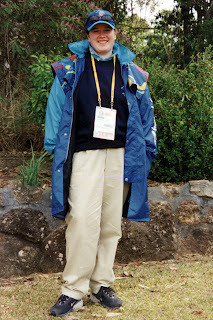 "I did a quick search for Australians who had joined the Genealogy Wise site (found 14) and invited them to join the group. As of this morning the group has 13 members." In a followup post 12 months later I wrote "Activity from the 263 members of the Australian Genealogists Group is patchy. Some days there will be a few posts and sometimes a couple of weeks go by without any activity." Since July only 8 more Australians have joined our group and only a handful of the 271 members have posted anything to the site. Is this because others, unlike me, have no resources or news of events to share with others and have no brickwalls that they want to demolish? There are a number of products that enable genealogists to connect with others via the internet. These include the wonderful free Rootsweb Lists and subscription sites such as Ancestry and Genes Reunited, general products like Facebook and Twitter offer further free opportunities for communication and collaboration. Australian Family History Societies and genealogy groups could use GenealogyWise to promote their events and organisations. 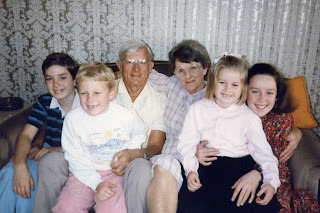 In this post http://geniaus.blogspot.com/2010/07/genealogy-wise-first-twelve-months.html I discussed how individuals can benefit from membership. Membership of this group need not be onerous - one can set the preference to have no notifications sent; one can just log in whenever one has a few spare minutes. I believe that having an online presence pays off so would encourage all genealogists with internet access to join GenealogyWise. Thank goodness the sun is shining now - I woke to an enormous clap of thunder and was selfishly worried about my journey to the athletics. Aussies aren't too strong in track and field so I'm thrilled to hear that a number have qualified for tonight's rounds. Marion Jones ran a good heat in the 200m this morning (so did my distant cousin Melinda) so I'll also see her this evenng. I feel so sorry for Marion as her husband/coach has been embroiled in a drug scandal (4 recent positive tests) and had his Olympic accreditation withdrawn - Marion is acting with dignity and supporting her husband but the poor girl does not need this pressure now. In the stadium we witnessed 200m semi-finals, decathlon events, men's pole vault qualifying rounds, hurdles finals and women's long jump qualifiers. Melinda (the distant cousin who doesn't know me) qualified for the 200m finals but was totally outclassed by Marion Jones and others in the final. The pole vaulters were the ones who amused me that evening - especially the poor guys who couldn't make it over the bar, but because their efforts were so short, didn't dislodge it. I thought one poor fellow would be up there all night - he did a great run up, planated his pole, leapt and I don't know if he had stage fright or what but he didn't let go of his pole and seemed to be swinging in the air for soooo long before he finally had the courage to let go. The Aussie crowd were very boisterous as we had three vaulters in this round - two made the finals. The stats provided on blogger blogs now make it easy to see which blog posts have been popular with readers. I am going to attempt to post each Monday (when I am not on holidays) a list of the pages from my Geniaus blog that have been the most popular with readers in the previous week. Remembering a gentle man, James William Ball, who passed away 20 years ago today on 27th September 1990. 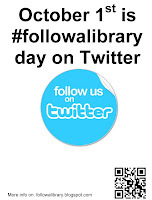 There have been a few tweets lately about the event #followalibrary day. Genealogists, please make sure you log onto Twitter that day and highlight those libraries that have supported your ancestor hunting. You can read about the day at the #followalibrary blog. My dilemma is that some of the libraries I use, including my local library at Hornsby, do not tweet. "We promote our library events and activities through our @HornsbyCouncil account." I will name those libraries and give their URLs in a tweet. Quite a number of genealogists who do not tweet may also wish to join in #followalibrary day by blogging about their favourite libraries - If you don't tweet how about joining up at http://twitter.com. I'd like to suggest that Geneabloggers who #followalibrary also use the hashtag #genealogy so that we can promote those institutions who support our habit. Visit UDAC (The Uniform Distribution and Accreditation Centre) at Redfern to collect my accreditation for the Closing Ceremony. In the evening I accompanied the MLC girls to a Closing Ceremony practice in a Silverwater warehouse. I'm also pleased to report that consumer patterns have influenced food prices at Olympic Park. Most people have been bringing in food and drink because of exhorbitant prices. Yesterday it was reported in the media that some prices had fallen. Last night it was good to see that many of the slick professional price-lists in the food areas had original prices covered by crude hand-lettered revised lower prices. Power to the people!!! After dark Olympic Park looks like a circus with lots of bright lights - the supporters in their imaginative and patriotic outfits add to this atmosphere. The best I saw was a German gentleman of about 80 with incredible bow-legs marching along proudly in his short lederhosen with a German flag flying from his backpack. A group of young Aussies yelled "Good on yer mate" as he strode by. At the track we witnessed the medal ceremony for the women's marathon that had been run that morning. I was listening to a radio commentary while watching - the commentator described the Japanese winner as "dimunitive and delcate with a broad grin" - she looked so young sweet and innocent - and did not fit my stereotype of a marathon runner. She won the hearts of the crowd with her smile. In my FollowFriday blog post today I commented "It is disappointing that SecondSite does not appear to give the user an option to search by date, place or name. It could be because the user has selected to disable these options that may be available." I have been thinking about this today and decided to investigate further by finding another Australian site using SecondSite software. I took a look at Carole's Family and have discovered that SecondSite allows not only for a Place index but also provides a calendar. Hopefully as her site develops Audrey will enable more of the features of this software on her site. My lesson from today is "Don't judge a product by the way it is used". I look forward in coming weeks to following other sites that utilise SecondSite and discovering how they have used this package. One of my favourite Aussie bloggers, Judy Webster, has raised the issue of "must haves" for a genealogy blog. This theme has been taken up by Thomas MacEntee at Geneabloggers as an Open Thread Thursday theme. "What gadgets, widgets, plugins, etc. do you consider ESSENTIAL for a genealogy blog?" A number of bloggers have made comments at Geneabloggers. As an opinionated genealogy blogger I must add my thoughts. A few months ago I wrote a post Geniaus - Mission Statement Missing in which I talked about audience and purpose in blogging. I think it is putting the cart before the horse to talk about what a blog must have before thinking about why the blog is written and for whom. Is the blog for entertainment, education, advertising or promotion? I would also add a search facility (ie Google search) so that the blog can be searched by keyword and provide a link for the reader to contact the blogger (this could be in the form of enabled comments or a simple email link). I applied a new template to my blog a few months ago so that I could add extra bells and whistles to my blog. I thought long and hard about which to use and where to place them on the page (and I am still shifting them around). 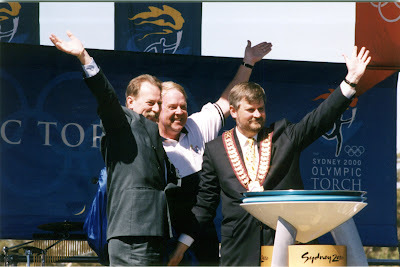 .I live less than an hour from Sydney's CBD in a semi-rural area where we, like our country cousins, have poor internet connectivity Although my blog is loaded with bling it seems to load in a reasonable time considering the constraints. Once a genealogy blogger has thought about the purpose and audience for her blog then it is time to consider which bells and whistles are appropriate to enhance that blog's unique character. 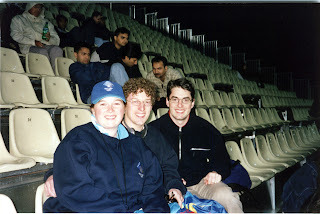 I was one of the lucky ones who had a roof over my head at the Olympic Stadium. I was concerned because we were in the cheapest seats - but we had a great view. I felt so sorry for the plastic-poncho clad crowd in the open stands (umbrella use is banned in stadium) when the heavens opened just before the semi-finals of the women's 400m race. Two Australian icons were in the races - unfortunately Nova Peris-Kneebone bowed out after her race - the tumultuous roar and beating drums of the crowd could not will her to finish in the first four. Aussie darling, Cathy Freeman, qualified for the final on Day 10. Only the hardiest of souls in the open stands stayed on to watch the rest of the events - this had a positive benefit for the Balls - the train home was half-empty. The grass around Olympic Park, which is in parts looking like straw, no doubt benefitted from the soaking. 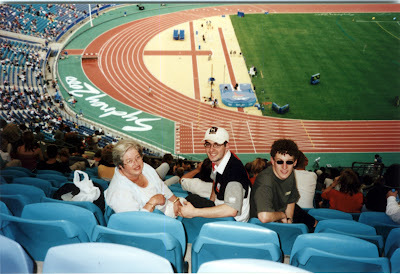 However it was sad that so many athletes had to perform in a stadium only one third full - the atmosphere really suffered. We watched the women's javelin part of the heptathlon, women's triple jump final, men's high jump final, men's hammer throw final and a number of hurdles heats. I had trouble concentrating as events were run concurrently and I always seemed to be looking the wrong way. A number of the jumpers encouraged the crowd to clap as they did their runups and jumps by waving their arms before they took off - tennis players certainly couldn't serve with this racket going on!! I'm now exhausted from watching the latest round of US and Australian triumphs in the pool (I hope you get TV coverage of this final session) followed by the Aussie girls (bronze medal winners in Atlanta) semi-final in beach volleyball against Brazil... the Brasilian supporters met their match with the Aussies chant today. Have you heard in any of the broadcasts Oi Oi Oi? At the table tennis the other night it was the young German (only in Oz for the games) sitting next to my husband, who started off the chant. Last night at the tennis the very serious lady from NZ who was sitting in front of me complained to the two young men next to me about the noisy conversation they were having (they didn't bother me I had my radio earphones in listening to other events) - she said she was there to watch tennis not listen to them - that just revved me up - it was with perverse pleasure that my Oi Oi Oi volume was delivered a few decibels louder than normal very close to her ear. A distant cousin of mine (she doesn't know me) Melinda Gainsford-Taylor is to run in the semi-finals of the 100m in a few minutes. Many of Australia's first white settlers were convicts transported to Australia from Mother England. Melinda and I share a convict ancestor. If she gets to the finals she will be stoked..... A FEW MINUTES LATER .... Melinda missed out on the final so she'll have to now wait for the heats of her favoured event the 200m. The heat was won by Jamaica's Merline Ottey - the first woman to make 4 Olympic 100m finals. With son 2, girlfriend and Mr Geniaus to the Baseball at Blacktown. It's a very hot and dusty day. We stop off at Westfield Parramatta to cool off, and buy a transistor in Kmart to follow other sports. Then it's to the tennis in the NSW Tennis Centre - Centre Court. We see the Woodies play doubles. Horror of horrors - there's thunder and rain here at my place. I'm 30 km to the north of Olympic Park...and at Mum's place 15 km to the east there's light rain....so it must be raining at Olympic Park in between. Jill and Mum to Badminton in Pavillion 3. The Badminton was a surprisingly exciting game especially the doubles matches they were fast and furious with long rallies. 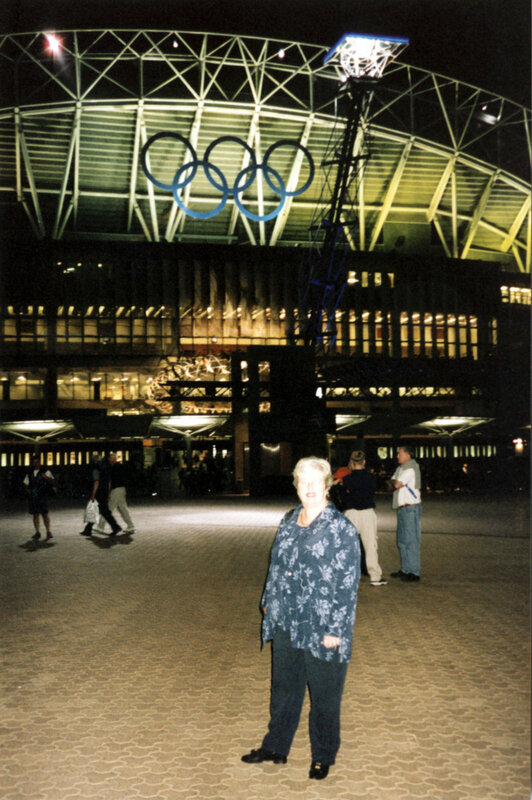 As Mum is anxious to get home she leaves before the games are over. My trek to State Records at Kingswood last week was most rewarding. As I stated on Twitter " Worth a visit @staterecordsnsw Had a wonderful visit yesterday-found some juicy info in probate packets and divorce papers #genealogy". As it had been a while since my last visit I read all the info on their website before setting out. I would only add "wear clothing with lots of pockets". One must leave bags in a locker before entering the Main Reading Room. I had a laptop, pencils, wallet, smartphone (for browsing the internet while there) , digital camera and extra battery and SD card (for photographing documents. If I wouldn't have had pockets in my trousers and cardigan it would have been quite a juggling act! If they supplied transparent plastic bags for bits and bobs, like the National Library of Australia does, this would be most helpful. During the seven hours I spent in the Reading Room I did quite a bit of eavesdropping. I was most impressed with the manner in which the female members of staff on the information desk dealt with requests from members of the public. There was a range of enquiries from basic to complex; all users were treated with courtesy and a genuine interest. These staff members went out of their way to make the users feel comfortable with using the records and gave the impression that each query was important. Unfortunately the one male who worked on the desk at times did not demonstrate the same level of interpersonal and listening skills. I can recommend the trek to Kingswood to anyone with an interest in genealogy in NSW. The parking is convenient, the facilities good, the staff helpful, the rewards surprising and it's free. It's Day 5 - 9.45 am on Wednesday and although I'm emotionally energised I'm physically exhausted. The weather in Sydney is picture perfect but it's spring and there are lots of pollens in the air and, as we haven't had any rain, lots of dust ... so my asthma has been acting up - the nebuliser is getting a real workout. The pace really hotted up when the US and Russia hit the court. I didn't know who to barrack for - I had an American gentleman on my left but he was outnumbered by the dozen boisterous flag-bearing Russians on my son's right. When the game started we were told that the teams were running equal first in their pool. At half-time (is that what you call it?) the Russians were leading by about 5 points and the mob on my right in their red and white Tshirts and caps were ecstatic. What an exciting game it was with the score see-sawing between the teams. In the last ten minutes one team lifted their game and got ahead of the others - the US were victorious winning by about 88 to 77(didn't write it down) and now lead their pool. I really liked number 9 - Lisa ??? and number 5 a short, nimble player. Number 13 scored lots of points. I could spend all day at Olympic Park observing the people - all shapes, sizes, races and ages together with TV crews on every corner interviewing and people positioning themselves for photos in front of the Olympic flame. Joie de vivre permeates the whole precinct. Geniaus and Daughter 1 to tennis at NSW Tennis Centre - Centre court. A marathon match between Magnus Norman and Pavel. In the second match Venus Williams walks over Henrietta ?? We get home around 12:50 am.
" The first match was a 3 hr marathon - went to 10-8 in the third set with Magnus Norman (Sweden) defeating Andre Pavel - it was a closely fought match. Although Venus Williams won her match against Henrietta from Slovakia last night 6-2 6-2 in about 50 mins I was disappointed in her play - she knew she was going to win and didn't seem to extend herself. I've been lucky enough to see her play at the Australian Open where she played like a real terrier going after every shot. Last night she didn't run the ball down as she usually does. It was interesting that Henrietta was sent off the court to change her shirt - she had one with the logo of a non-Olympic sponsor. Venus was allowed to wear her Reebok gear - they are sponsors. The problem with attending these sessions is that one can't watch the highlights on TV - many people therefore bring walkmans to listen to radio commentary. Last night each time Australia won gold in the pool a great cheer went up disturbing th quiet atmosphere in the tennis stadium. It was a docile crowd at the tennis - very few flags and decorated spectators - probably because the session was sold out long before the draw was announced and supporters from the countries represented had no access to tickets." 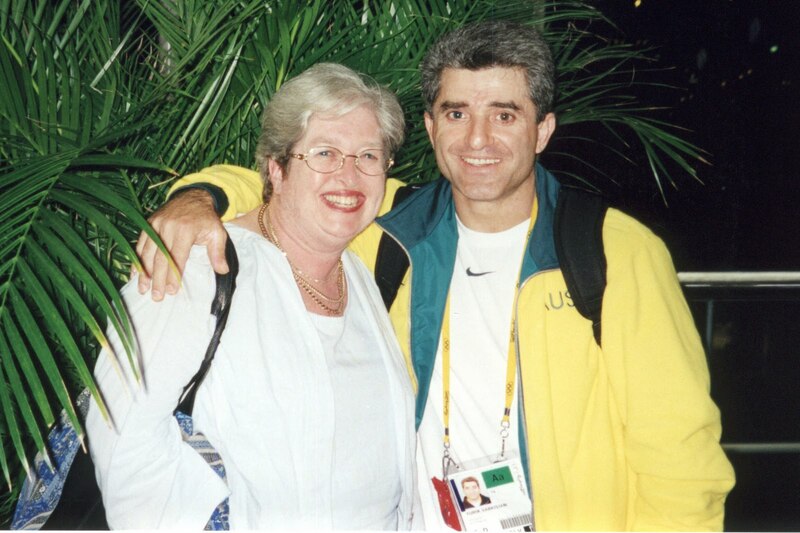 "I found the rules of volleyball and set off on Monday to the Sydney Entertainment Centre at Darling Harbour with a bag full of sandwiches and drinks to watch the women's volleyball. We had a great view from our $19 seats. Poor Australia, as the host nation, were able to field a team - we were outclassed by Brazil. The Brazilian supporters were so colourful - a couple of hundred of them came in matching tshirts, with wigs, flags and other supporter stuff, one had a trumpet and played a fanfare whenever Brazil scored - many of the Aussies in the crowd also dressed for the occasion with facepaint, tshirts, flags and ridiculous hats. It was a noisy, enthusiastic environment. The second game - Cuba vs The Russian Federation was a nailbiter - it went to five sets (the maximum) and kept us on the edge of our seats. it was interesting to note the coaching techniques employed by the teams - the Russian appeared to continually berate his girls whilst the Cuban seemed to encourage his girls - there were lots of hugs and high fives on that side. I'd thoroughly recommend volleyball as a spectator sport." 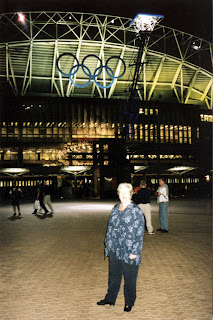 With my husband I attended an evening session of the weightlifting at The Sydney Convention Centre After a pleasant stroll through Darling Harbour which seemd to be one big party we watched weightlifters grunt and groan as they lifted enormous weights. My choice for this week's Follow Friday Australian FamilySite is a site that has been established for twelve years. As such, like last week's site it misses out the features made available by the advances in web authoring that have become available during that time. 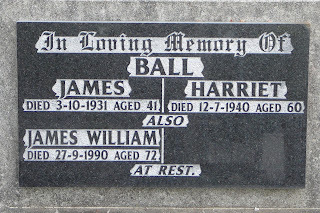 The highlight of this site is a collection of Victorian headstone photographs that have been photographed, organised and indexed by the author. This is a great piece of work by a commited volunteer who generously shares her photos with those who make a request through the site. An offer to share photos from a large collection of Victorian Headstone photos. 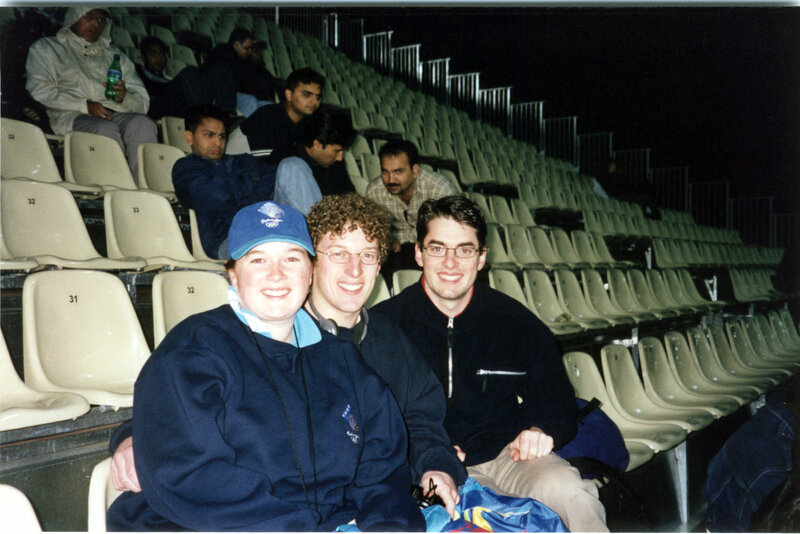 I had also managed to procure a couple of extra Dress Rehearsal tickets so with Mr Geniaus and a couple of our offspring we set off by train "to Opening Ceremony Dress Rehearsal at Stadium Australia. When I look at my blog statistics I notice that, whilst Australians are the biggest group that visit my pages, around half of my readers drop by from other countries, mostly the US and UK but also including South Korea, Netherlands, China, Denmark and Russia. As a very proud Aussie I have been wanting to show readers what a diverse and beautiful international city Sydney is. I have trawled Youtube for a video to post but nothing seems suitable; the videos are mostly short and superficial ones that show tourist destinations and portray an artificial lifestyle. I have recently been following the 52 Suburbs blog, in which blogger Louise posts a weekly photographic portrait of one of Sydney's suburbs. She says "My name is Louise. I've lived in Sydney for over 30 years but have never set foot in most of its 600 plus suburbs. Now I'm on a mission to explore and photograph one new Sydney suburb a week for a year in search of the beauty in the 'burb." Louise's blog has a focus on the people she finds in the burbs and highlights many of the interesting individuals who breathe life into our beautiful city. Louise has presently published 48 suburb portraits; the post on Dural is the closest geographically to my home on Sydney's semi-rural northern outskirts. This visit took place on ANZAC Day and records the activities on this most important Australian day of Remembrance. Readers, if you take a look at a few pages of the 52 Suburbs blog you will get a non-tourists view of Sydney through the eyes of another proud Aussie. Both Geneabloggers and the Society of Australian Genealogists have exhorted genealogists to reflect on 9/11 today. My diary entry for September 9, 2001 is "After the Twin Towers tragedy in America we are rethinking our plans to travel to the US next week." I remember clearly sitting in the study when one of my children phoned and suggested I turn on the TV to see what was happening in the US as we were due to fly there in a few days time to meet up with another son who was travelling around the world. I watched in horror as the events of that day unfolded. Of course, on a personal level, I was disappointed that our travel plans were under threat but my heart went out to the families who lost loved ones in the tragic events that unfolded that day. We were advised not to travel to the US. QANTAS gave us a full refund for our airfares and we were able to cancel our hotel bookings in the US. We had booked tickets to see Ringling Bros, Barnum and Bailey Circus in Salt Lake City; unfortunately we could not get a refund on these tickets and couldn't find a way to give our tickets to a needy Utah family. Our son, who was in New Zealand, was able to alter his travel plans to travel to Europe via the US with just a short stopover. As a family bistorian I was most disappointed that I missed an opportunity to do some research whilst my husband was attending an ICMA Conference in Salt Lake City. I have yet to visit the Family History Library although I was lucky enough on an earlier visit to hear the Mormom Tabernacle Choir. I also missed an oportunity to attend a library conference somewhere south of Chicago. We were easily able to change our travel plans and attend a library conference at the Twin Waters Resort in Queensland. My disappointments pale into insignificance when compared with the devastation experienced in NYC. On a recent visit to New York we were sobered by a visit to Ground Zero, the site of the Twin Towers. I constantly think of those people in New York City and our family members in the US who were affected by the events of 9/11 and feel blessed that I live in The Lucky Country. My policy of giving open access to the data on my family history website reaps huge rewards. TNG, the software I use has a facility for visitors to the website to make comments. This comment I received today from a young Australian is typical of those that I get each week. Comments: Hi. I found this page while searching the name of my great great grandmother. And I would just like to tell you that it's great!! Also it might just be a typo but you have ****** my great grandfather down as dying in 1973, I believe this should be 1983. As from what I know he died the same year as his son kevin a few years before I was born also you have two of ***** and ****** 's children down as living. Only one is still living my grandmother merleen. Mervyn ***** died on the 26th oct 1990. I know this is not much in the giant scheme of things and compared to the loads of information you have but I still hope that it is some help. Many thanks :) I learnt a few things about my family history that I didn't know before today. The first Australian FamilySite I have chosen for my Follow Friday Series is "A Newman Family Tree." Although the design of this site is dated and navigation is tricky it has a wealth of data with reference to numerous old documents. There is evidence of a depth of research. Pasted below is the first draft of a rubric that I am developing to examine the Australian FamilySites that I highlight. I look forward to suggestions from readers on additions and amendments to this table. Appears to have been established in 2002. Could be author's html site.
" hundreds (thousands?) of names of people"
Only for those with a dedicated webpage. Password Protected Open Access except for living persons. Names but no further details given - need to apply for access. Page with list of sources and notes at end of individual pages. Yes - using PicoSearch one can do a full-text search. Attached to individual pages. There doesn't appear to be a separate index for photos and documents. Static sidebar index to pages. Pages do not have individual addresses. There are links within pages. Basic website design using frames, needs updating. The text rich pages appear busy. Dedication to the Father of the webmaster. A popular Geneabloggers blogging theme is "Follow Friday" in which bloggers "simply create a post in which you recommend another genealogy blogger, a specific blog post, a genealogy website or a genealogy resource." I was rather chuffed last Friday when Judy Webster nominated my blog in her post. I have been toying with blogging about and highlighting some sites where Australians have placed their family trees on the web. There are some fantastic sites around that probably don't get any recognition. I will endeavour to show some of these through a series of Follow Friday posts. Those who are considering placing their family trees on the web might find guidance on what to do and what not to do from this series of posts. As I have several hundred sites bookmarked on Delicious it won't be an onerous task to find some. I want to show the good, the bad and the ugly; the workhorses and show ponies. I will develop a basic rubric against which to measure the sites so that I will have a consistent approach. I just need to learn how to insert a table into blogger! Hopefully, in a few hours time, I will have made my maiden "Follow Friday" Australian Familysite post. Firstly the State Records Website was down: in frustration I tweeted about this and commend State Records for ther reply this morning "staterecordsnsw @geniaus Oh good. Automatic website updates occur overnight and may affect your browsing session. Hope you have a succesful research day! " After a short time I discovered that the site was back up. I thought I would read the tips for visiting. I learnt that to look at original documents I needed a current Reader's Ticket. Alas, my ancient ticket had expired but I was able to apply for a new one online. As I thought this government instrumentality wouldt take a while to process my Reader's Ticket request I gave up on planning for the visit, had a hot bath and an early night. Oh ye (me) of little faith! When I opened my email box this morning there was a message from State Records indicating that my Reader's Ticket was ready for collection. I am now planning to request my documents for a visit on Wednesday (as one needs to give at least two working days notice for retrieval of documents). Thank you State Records for your prompt feedback and attention to my request. I look forward to uncovering some family secrets on my visit. "FREE lecture wed 8th SEPT RSVP essential"
"If you had convicts between 1810 and 1821 it is likely they could have been affected by Gov Macquarie's building program. A few of my convicts arrived during Macquarie's reign and two of them worked on a Macquarie project, the construction of the road over the Blue Mountains, so I RSVP'd and went along to see what the Prof had to say. Professor Parsons presented in a relaxed style with touches of humour an interesting portrait of Macquarie and his times. He indicated that ecomomic and environmental conditions of the times were catalysts for some of Macquarie's works. I hadn't given much though to this early governor I just knew that his name is on many Sydney institutions and roads. Although Professor Parsons is an academic his talk had general appeal. I learnt that Macquaire's job in the colony was to restore legitimate authority, reestablish the food supply and to develop the fabric of the colony ie road, bridges and buildings including the commissariat. Because of a number of natural occurrences such as drought, floods and caterpillar plagues Macquarie found that he had a lot of idle convicts on his hands. To employ these souls gainfully he embarked on an ambitious building program during which "many grand buidlings ahead of demand" were constructed. Macquarie was to incur the wrath of the British Government due to the funds he spent on these projects. Although I love technology it was refreshing to attend a talk where the speaker spoke off the cuff with mininal reference to notes and without a powerpoint slide in sight. Thank you Elizabeth Roberts and people behind the Convict Trail Project for organising this lecture. I just posted a long comment on Elyse's genealogy blog in response to her post today Online Family Trees: A Genealogist’s Dream or Nightmare? Elyse compared name collectors who have large online trees with relationships and facts that are not always verified with real genealogists who search "vital, census, military, land, court, church, and every other record" to source the relationships and facts in their trees. "I am a name collector....I use the names collected from online family trees, newspaper articles and websites such as Facebook as a means to find distant cousins. Being armed with a name and date (especially for the Smiths and Browns) provides me with clues with which to search "vital, census, military, land, court, church, and every other record" I can find to verify the relationships of those names to my family. I spent yesterday doing just that. As I added the names to my tree I concurrently searched Ancestry, FindMyPast, Australian Government BDM indexes, NSW State Archives,Familysearch,The Ryerson Index, Australian Cemetery Indexes,Trove and The Sydney Morning Herald Online to try to prove whether these people belonged in my tree. By the end of the day I had identified one whole line of Brydon/Bryden descendants of my convict ancestor, Elizabeth Phipps. I uploaded this to my online family website http://www.geniaus.net so that other "name gatherers" might use what I have gathered as clues to solve their genealogical jigsaws. For me genealogy/family history is not a serious academic pursuit but a hobby/passion/obsession about which I am very serious. By posting names for which I don't have evidentiary documentation of relationships/existence on my website I have made worthwhile connections and entered into dialogue with cousins from all over. Some of these people have generously shared photos and documents relating to the names I have posted thus making the presence of those names in my tree legitimate. Name gathering can be a means to an end for genealogists. Where are you Bill Blowes, Don Magick, Val Dumbrell, Keith Colbran, Leonnie Elwell, Ken Edmondson, Glenn Martin? I just sent out a group catchup email to some of those people with whom I have shared information over the last few years. Six out of the fity or so messages bounced back. These people have probably changed their web service provider and email address but haven't been able to let all of their contacts know of the change. I previously blogged about Static email addresses in November 2008. In the world of genealogy where one posts interests on mailing lists, with user groups and on websites it is advisable to have a permanent address that will not change. Sometimes it might be four or five years from the date of posting a message somewhere until one gets a response. It is very easy to set up a permanent email address with services such as Gmail, Yahoo or Hotmail that is not tied to one service provider. If you don't want to miss out on valuable connections get one now. In many towns and suburbs in New South Wales one can find War Memorials erected to honour the contributions of those who served their country. On the Register of War Memorials in New South Wales website one can perform a search to find out if a particular person has been honoured on such a memorial. As this project has not yet been completed there ar many names missing. I could not locate my father, grandfather of some uncles but did find cousins listed. To date there are 1619 War Memorials and 149,294 Veteran Names listed. A note on the site states "There are more than 3,000 war memorials in our State, and the NSW Government and the RSL (NSW Branch) are committed to documenting each of these memorials with care and respect. " As this site grows it will become a very useful resource for family historians. He got up, unplugged my computer, and threw out my wine.